A central cooling plant in Google’s Douglas County, Georgia data center. Google has long been a giant on the Web, but a new DeepField study reveals how just gigantic the search engine has become. According to the study, a whopping 60 percent of all Internet end devices in North America exchange traffic with Google servers on a typical day. This includes all kinds of computers, mobile devices, home media appliances, gaming consoles, and similar embedded gadgets that tap into the Web. Amazingly, Google’s device share is even greater when only computers and mobile devices are included. For further proof of Google’s greatness, Wired.com posted additional details from DeepField. The DeepField study also notes that Google now accounts for almost one-quarter of all consumer Internet traffic. That’s a huge increase over the mere six percent of Web traffic it represented in 2010. While the majority of Google traffic comes from YouTube, a substantial amount involves search, Web apps, advertising, and analytics. “What’s really interesting is, over just the past year, how pervasive Google has become, not just in Google data centers, but throughout the North American Internet,” says Craig Labovitz, founder of DeepField. No wonder Google is racing to build more data centers. Google’s massive Web coverage means an ever-increasing stream of online data. The company currently has data centers on four continents, but may soon need more to house the thousands of special servers it’s added to ISPs worldwide. These servers are called Google Global Cache (GGC) servers and they store the most popular content from Google’s vast network and then serve it straight from the ISP’s data center, which is much faster than serving it from Google’s data center. 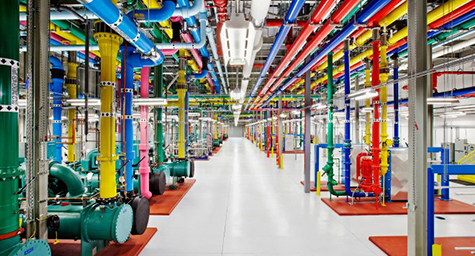 These servers are now in 80 percent of Google’s North American ISPs. DeepField notes that the deployment of these servers in Internet providers all over the globe may be the most dramatic change in Google’s Internet presence. In addition to its title as the titan of search, Google is also considered the world’s leader in infrastructure development, even though it strives to keep that work a well-guarded secret. Now, Google is advancing beyond building data centers and deploying servers in numerous ISP network operations centers just miles from its customers, which is commonly called the “edge” of the network. Other Internet leaders are expected to follow Google’s lead. Keep up with the dynamic digital marketing scene. Contact MDG Advertising today at 561-338-7797 or visit mdgadvertising.com.